Cloudy skies with periods of rain this afternoon. Thunder possible. High 57F. Winds WNW at 10 to 15 mph. Chance of rain 70%.. Scattered thunderstorms during the evening. Mainly clear skies after midnight. Low around 40F. Winds W at 10 to 20 mph. Chance of rain 50%. Your Shots are readers' outdoor photos shared with Montana Untamed. To share your outdoor photo with us, send a copy in an email to french@billingsgazette.com. Please include your name, phone number, when the photo was taken, the photographer’s name, where the photo subject is from and the general area where the photo was taken. Photos will appear in print and online at MontanaUntamed.com. 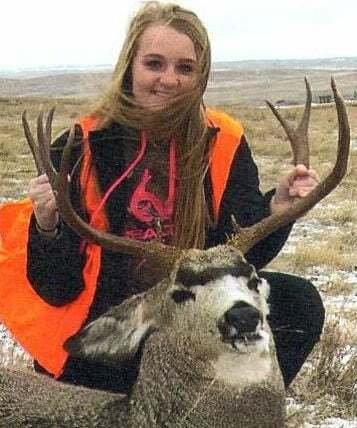 Shelby Morgan, 16, of Poplar, shot this buck mule deer in the rut on Nov. 3 while hunting with her father, Dwain Haggard, about 10 miles south of the Missouri River and Fort Kipp. It's only the second deer Shelby has shot but as she noted, "this one was huge." Nicole Wildin, 23, of Billings, shot her second deer and first whitetail while hunting in mid-November in the Little Snowy Mountains with her father, Russ Wildin. Whitehall resident Jill Honer doesn't have to go far from home to capture beautiful scenic and wildlife photographs like this one of a whitetail fawn checking out the birdbath. Whitehall-area resident Sarah Smart captured this photo over Easter weekend of a young bull moose jumping out of her yard. She lives in the Highland Mountains, close to Lost Moose Road. This young bull was photographed in Sarah Smart's backyard. Eleven-year-old twins Mason and Smith Schuyler, of Bozeman, used 20 gauge shotguns to bag two toms near Three Forks after their father, Matt Schuyler, called them in close on May 12. Their grandfather, Dave Schuyler, lives in Billings.